Buy 60KW industrial paper egg tray microwave clean fast dryer - Shandong Leader Machinery Co.,ltd. shandong leader machinery co.,ltd. strives to meet all legal and ethical requirements, and, as soon as possible, we also strive to go beyond these requirements. shandong leader machinery co.,ltd. 's responsibility is to do business in accordance with the highest professional and ethical standards and practices: the company will not tolerate any noncompliance. Our principle of "responsibility for responsibility" is our compass for making business decisions. We must also encourage our business partners, suppliers and other stakeholders to follow the same high ethical standards. 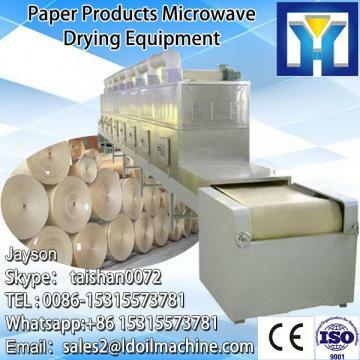 Paper Products microwave drying equipment applies to chemical fiber paper, cardboard, honeycomb paper, kraft paper, corrugated paper and other paper products drying dehydration, including microwave sterilization at the same time, especially for food packaging paper products. The application of Paper Products microwave drying equipment mainly solves the drying problem of paper products and other wood pulp products; because the thermal conductivity of paper products is poor, it is difficult for the infrared electric heating equipment to effectively evaporate the moisture inside the product, resulting in uneven drying or drying, For the inconvenience of production also increased the paper drying requirements of the site. Microwave can penetrate the interior of paper products, so that the internal moisture friction outward evaporation; the same direction of wet and heat conduction heating method can make the drying material texture uniform, quickly and effectively complete the drying. 5 conveyor belt frequency control, smooth and fast, users can choose according to different specifications of the paper bag the best speed. 1. Strong glue,greatly improved water resistance and compressive strength. 2. Fast drying,cardboard uniform,flat,small change. 3. Have strong sterilizing function while in microwave drying process,greatly improved mildew resistance ability. 4. Compared with far infrared drying,drying time short two-thirds,electricity consumption save 1/3. Mainly used in drying paper,cardboard,paper tube,paper round pipe,edge bore,gray cardboard,sheet-paper industries.microwave drying equipment also used for drying stereotyping a variety of cardboard,gray cardboard,kraft board,cardboard boxes,paper pulp,cardboard,pulp model etc. business in accordance with the highest professional and ethical standards and practices: the company will not tolerate any noncompliance. sterilization at the same time, especially for food packaging paper products. production also increased the paper drying requirements of the site. can make the drying material texture uniform, quickly and effectively complete the drying. variety of cardboard,gray cardboard,kraft board,cardboard boxes,paper pulp,cardboard,pulp model etc. This equipment are widely used for drying and sterilizing powder,granular,flakes or colloidal form foods such as: nutritional health products, grains, agricultural and sideline products, bamboo shoot, tea, mushroom, agaric, ganoderma, vegetables and fruits, preserved fruits,red jujube,non-fired instant noodles, noodles, rice powder noodles, chicken jerky, beef jerky, preserved meat, dried fish, seafood, pickles, spices, egg yolk powder, jam, a variety of small packaging and pet food mildew sterilization preservation. Microwave herbs drying and sterilization equipment are mainly used for drying and sterilizing all kinds of tablets, pills, powder, capsules, ointment, oral liquid, medicine bottle, medicine wine bottle, Chinese-western medicine, medical gloves and garments etc. This equipment is suitable for cold chain cassette fast food, low temperature sterilization. The microwave heating fast food, ready to eat meal, rice meal, snack etc,low temperature sterilization can keep original nutrition and taste. Microwave industrial tunnel baking & puffing equipment are widely used in the peanuts, sesame seeds, wheat, melon seeds, sunflower seeds, peanuts, corn, soybeans, walnuts, almonds, chestnuts, pistachios, cashews, filbert and dried fruit etc; and for puffing of leisure food, potato chips, dried shrimps, fish maw and so on. Compared with the traditional production methods, microwave baked foods are crispy and delicious, products particle puffed full, natural color, beautiful appearance, and has insecticidal sterilization effect. Microwave equipment drying and kill worm egg for bamboo, wood(pencil board,wood floor,hanger etc), old mahogany, ebony, cherry wood, basswood, birch, teak, oak, boxwood, pear wood, beech, mulberry, serpentine wood, maple spruce, pine, hemlock, cercis, jacaranda, sophora japonica, maple wood, poplar, maple, holly, ginkgo biloba wood, camphor wood etc. Microwave drying is a new type of drying method. When drying, microwave converted into heat energy that can be applied directly to medium, because the microwave has penetrating performance inside and outside the media, heating at the same time, do not need to heat conduction, so very fast heating, the water content below 30% of food, can shorten the drying speed hundreds of times. Regardless of any shape objects, because the object of dielectric heating at the same time, both inside and outside material of inside and outside temperature difference is small, uniform heating, the drying quality greatly improved. For the whole 60KW industrial paper egg tray microwave clean fast dryer,warranty is 12 months,within 12 months,if have equipment quality problems,we will provide accessories freely. After the expiration of the warranty period,if have spare parts problem,we only receive the cost of required replacement parts.We commit we will provide free technical support of equipment all whole life. Our company has engaged in producing and exporting 60KW industrial paper egg tray microwave clean fast dryer for many years, and until now, our machine has exported to overseas market, such as Brazil, India, Indonesia, Russia, Thailand and so on, and get the foreign customers' unanimous praise. We believe that you purchase shandong leader machinery co.,ltd. 60KW industrial paper egg tray microwave clean fast dryer is your best and sensible choice.